Edit 22/4/15: the link below now provides a complete set of trains used on the finished GB map. In conjunction with my Great Britain map, I've been making lots of contemporary British rolling stock. I'm now ready to release a first version of the trains I've been using on that map for general use. The pack contains Standard and Experimental versions, as well as sources. Please consider this a beta release. Many of the vehicles still need work. While vehicle stats (power, speed, capacity) are more or less accurate, intro years and economic balance are not by any means accurate. Furthermore, there are lots of graphical tweaks needed. I will, of course, update the package given time. Thany you Carl for The British Trains Beta release. How do you add these trains into the great Britain PAC? That isn't possible since the Britain pak is a 128-size pak, and these are 64-size models. You can add these models to any 64-pixel size pak: i.e. pak64, pakGerman, etc. Pak-128Britain contains many (if not most) of these trains anyway. Sorry i meant your great Britain rail network. Whenever i copy them into pak.ngb newconveys they come up as missing conveys. Oh, I see. These should already be present in the pakset provided with the savegame. It's possible that I've provided an out of date version of the pakset with latest version of the savegame -- I'll check on that shortly. 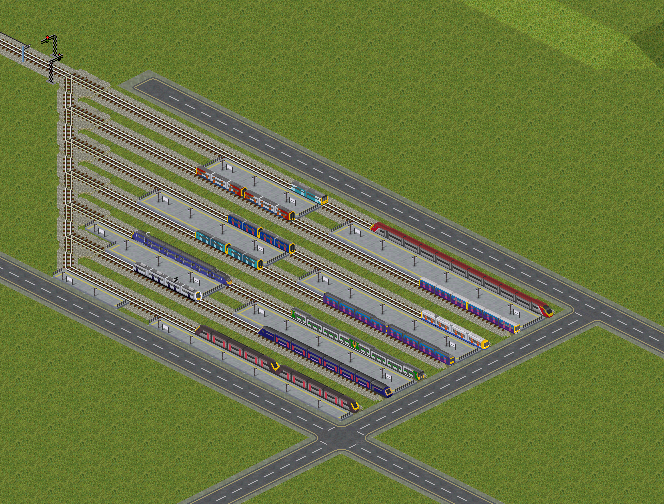 You'll find a wider range of trains, as well as some graphical fixes for those already present. Once again, both Standard and Experimental versions are provided along with sources. I eventually plan to roll out this change to other units too. There's still a lot of variance in quality here. Some vehicles, like the HSTs, are more or less up to pakset standard graphics-wise, but others are far from up to scratch at the moment. Here's a full list of trains included in this set. It features a few new trains, plus improved (and in many cases lengthened) versions of existing trains. As a slight deviation on this I am drawing older and fantasy liveries from Carl's sources - NSE/Inter City/Regional Railways and British Railway style liveries for units introduced after privatization. Although currently it has no dat files yet, i'm hoping to clean up (no offence Carl!) the pakset and look to possibly start on buildings and maybe some new stations. I will also look to simplify the tracks (3 or 4 tracks, all the same style and speed!) and draw a third rail. Essentially start creating a pak64.britian. To keep Carl's actual save game thread clean i'll show off the new liveries here instead - hopefully some buildings may start soon too. All work so far is included, plus an Intercity 317. The incomplete 395 is because I need some feedback about the drawings. An impressive collection building up there! Any feedback regarding the 395, i'm not sure if it is in keeping with the style the SE livery was - it's far less grainy/detailed than your one. I've held off drawing it further while I decide how best to approach it. I think the doors extend too low, and could do with an extra pixel skimming off. Thank you for the photo from this Nice trains. A single unit for you today - 455 in NSE livery. First and only day off in 10 days so bare with me on the project! I spent a large part of today studying Carl's work more in depth with both the colours and which image is which. As a result i've realized an error in my painting where i've painted the wrong parts of the train in certain places. Specifically i think a few of the paintings on the EMU's have got the cab painting where the dat file thinks an intermediate coach is. The end result of the time spent studying the images is a text file containing the major colours for every TOC. I will us this as I do both fantasy, historical or just for the hell of it liveries. I've also changed my approach to doors deciding that on the older units which did run as say, NSE will receive doors painting as they were in real life. To ensure that the doors stand out if you zoom to 800% the painting won't look true however from 100% you can see the door more clearly. Please provide any and all feedback regarding this - I think this is the best designed unit i've done because of the time spent understanding how the colour scheme works. I agree, that one looks really excellent! A very quick update - i think a few of the already painted trains may get a bit of a touch up following the various things i've learned since starting - obviously a lot of quick progress was made but i believe there is lots of room for improvement. seeing as how i'm not very good at painting the actual chassis of the stock, i'm still running on what i think are final versions of Carls work and all of my is still derivative of this. Hopefully as Carl finishes off his epic project this smaller one will not be too far behind. For the time being i've had to slow down a tiny bit but i'm still looking and painting and next week might see a large number of new units - hopefully a completed 395, a re done 377 or two, the HST and a few more. I'm also going to streamline the pak and all of my additions to take advantage of the livery function of experimental while also making pak files for standard available. The biggest challenge now i've isolated colours is picking a way of getting BR Blue down and inline with teh rest of the scheme and cutting the unneeded parts of the source files out so we will hopefully have a smaller download. Then i can pak up the entire lot using these sources. I will keep liveried trains in seperate png files and link them only in the dat file for now and look to perhaps merge it in to a series of unit png files at a later date. Not all of mine are strictly final - some of the earlier units are still due an update, especially those which are still half a tile (length=8) rather than length=10. For instance, if you're looking at class 158s, use the Northern one as a base rather than the EMT or FGW ones, since I haven't gotten around to updating the latter two. That was what i was trying to elude to without being rude and sounding like i was just saying "because Carl didn't finish the pak, i can't do stuff" when actually it is a constantly evolving project with (for your part) a great many things to consider! With that in mind, i'll see what I can do to aid in painting newer versions of units with the missing liveries. I have a teaser for you - it's a new BUS. Brighton and Hove bus liveried. It's not finished, but it's a start. Enjoy! EDIT: Finished! Bonus points if anyone knows what bus this actually is. I'm quite happy with it as a first draft. Feel free to provide feedback and let me know where it needs improving. EDIT: Carl, i've just noticed a... time saving "thing" you've done - the 444 and 450 have the same body despite the 444 being closer to LHCS rather than an EMU in design (doors at the end specifically). Cheeky! I assume that anything with "new" after isn't going to be changed, such as the 377 but the 444/450 look like they're still in the older style. I'll leave them for now unless you say they are final versions? Ta. For some reason I missed your last post KneeOn - apologies. I've got a few more designs coming your way very soon - the World Cup is now taking upa lot of my time but with only 2 game slots now I intend on cracking on as soon as i get home from work until the first game of the day. One of the designs is going to be some form of retro unit (4CIG most likely). Also, anyone who is a trainspotter or happens to work on the railway will know that Govia have won the rights the TSGN Franchise (Southern, FCC and a tiny part of South Eastern all in one) and that the DfT have a new Cl700 train on the way AND that will be delivered in a grey livery with white flashes and blue doors AND that a plain white 319 with blue doors is about to reenter service after being given a TSGN style livery. some or all of these things will be attended to at some point. I need to give the Cl319 a going over at some point. It's probably the one I'm least happy with -- that front end is not especially realistic. I have no idea how i forgot about that, it's been plastered all over as part of our "commitment to the future of the route" or whatever. I think three 365's are already done. and maybe a 321 but I can't be sure on that one. I did take a look at redoing the 319 but it proved to be beyond me - that front end is quite hard to get right with a 64 pixel set. It is, which is why it ended up looking like it does now Anything with a slant is pretty challenging actually. My Class 321 is just about passable but it's still not quite right. Having painted that 222 in IC colours, i'd agree - slopes are far easier because the gradient doesn't look wrong. I've got a couple of ideas for the side view but getting that front one right is probably the hardest. maybe some clever shading? It'd be hard to not make it look two tone. I can't help but notice it's one of the smaller looking units - especially on the width. I'll play around with some front and side views later if i remember and see if i can contribute anything. EDIT: NO slam door stock today, mostly because world cup and the fact that this unit was quite challenging to draw to my liking. Someone should do the Class 380. This engine is not only famous for its unusual design, but also for its very poor side panelling that looks like it has been hammered into place rather than neatly engineered. They also make an annoying electronic alarm beeping sound as they drive past for some reason (probably health and safety related). It is also a very modern engine which would be great for expanding late game convoy choice (2009 - 2011). I have painted the Class 380 and it will be in the next set of vehicles I release -- I should get around to doing that this weekend. The 380 is one of the more unique "new" units on the network - even though its part of the Desiro family. Carl, it'll be interesting to see how you approach this unit - it's got a flat yet slanting front. If you've done a job you're happy with on it could you be looking at the way to improve/repaint the 319? Also, how do you replace old units with newer versions in your map - using the replace feature or by swapping out the .pak file but retaining the name? The 380 was actually easier than the 319 since I was able to adapt the 377/379 and obtain an acceptable result. You can see it at the end of the Birmingham to Glasgow video, although the video might not be HQ enough for you to see the detail. I usually replace the pak file and keep the same name. This isn't always possible or desirable, but it works most of the time. It does have some side effects, especially when making units longer -- so I have to be careful to troubleshoot after making a change like that. I see, i thought replacing the pak name would be best. Quick question on the set attached to the finished save game - what is up with the super long tube, 317 and 315s? EDIT: I think modeling the improved 319 on the 380 would be wise - the diagonal slant is really good on that 380. I see, I like the fact it's got almost pak128 level details but retains the pak64 style. 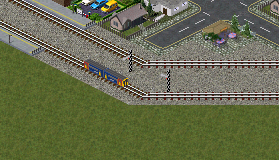 Yes, the extra pixels do allow for a pleasing amount of detail - but trains of that length are only really usable on maps with very low meters-per-tile settings, I think. Otherwise you can easily end up with trains longer than 1km -- which is fine for casual maps, but not when you're trying to simulate an actual network. Hey hey hey, i'm still working on this with loads of unfished units - i'm hoping to get a few out soon. For the time being theres a first group 442 and a stagecoach nearly finished single decker bus based on the previous design i've done. Another finished unit: A first group 360. Note: This is the old version because I can't read properly. I'll likely work on a new version in the near future. Very nice as usual, KneeOn! Reading up, it looks like I never got around to uploading the last round of new units and unit updates. I should rectify this soon!